It has been suggested that Yaśodharapura be merged into this article. (Discuss) Proposed since April 2019. For the temple, see Angkor Wat. Angkor (Khmer: អង្គរ pronounced [ʔɑŋ.ˈkɔː], lit. capital city) was the capital city of the Khmer Empire, which also recognized as Yasodharapura (Khmer: យសោធរបុរៈ; Sanskrit: यशोधरपुर) and flourished from approximately the 9th to 15th centuries. Angkor was a megacity, supporting at least 0.1% of the global population during 1010–1220. The city houses the magnificent Angkor Wat, one of Cambodia's popular tourist attractions. In 2007, an international team of researchers using satellite photographs and other modern techniques concluded that Angkor had been the largest pre-industrial city in the world, with an elaborate infrastructure system connecting an urban sprawl of at least 1,000 square kilometres (390 sq mi) to the well-known temples at its core. Angkor is considered to be a "hydraulic city" because it had a complicated water management network, which was used for systematically stabilizing, storing, and dispersing water throughout the area. This network is believed to have been used for irrigation in order to offset the unpredictable monsoon season and to also support the increasing population. Although the size of its population remains a topic of research and debate, newly identified agricultural systems in the Angkor area may have supported up to[weasel words] one million people. The Angkorian period may have begun shortly after 800 AD, when the Khmer King Jayavarman II announced the independence of Kambujadesa (Cambodia) from Java and established his capital of Hariharalaya (now known as Roluos) at the northern end of Tonlé Sap. Through a program of military campaigns, alliances, marriages and land grants, he achieved a unification of the country bordered by China to the north, Champa (now Central Vietnam) to the east, the ocean to the south and a place identified by a stone inscription as "the land of cardamoms and mangoes" to the west. In 802, Jayavarman articulated his new status by declaring himself "universal monarch" (chakravartin) and, in a move that was to be imitated by his successors and that linked him to the cult of Siva, taking on the epithet of "god-king" (devaraja). Before Jayavarman, Cambodia had consisted of a number of politically independent principalities collectively known to the Chinese by the names Funan and Chenla. In 889, Yasovarman ascended to the throne. A great king and an accomplished builder, he was celebrated by one inscription as "a lion-man; he tore the enemy with the claws of his grandeur; his teeth were his policies; his eyes were the Veda." Near the old capital of Hariharalaya, Yasovarman constructed a new city, called Yaśodharapura. :350 In the tradition of his predecessors, he also constructed a massive reservoir called baray. The significance of such reservoirs has been debated by modern scholars, some of whom have seen in them a means of irrigating rice fields, and others of whom have regarded them as religiously charged symbols of the great mythological oceans surrounding Mount Meru, the abode of the gods. The mountain, in turn, was represented by an elevated temple, in which the "god-king" was represented by a lingam. In accordance with this cosmic symbolism, Yasovarman built his central temple on a low hill known as Phnom Bakheng, surrounding it with a moat fed from the baray. He also built numerous other Hindu temples and ashrams, or retreats for ascetics. Over the next 300 years, between 900 and 1200, the Khmer Empire produced some of the world's most magnificent architectural masterpieces in the area known as Angkor. Most are concentrated in an area approximately 15 miles (24 km) east to west and 5 miles (8.0 km) north to south, although the Angkor Archaeological Park, which administers the area, includes sites as far away as Kbal Spean, about 30 miles (48 km) to the north. Some 72 major temples or other buildings are found within this area, and the remains of several hundred additional minor temple sites are scattered throughout the landscape beyond. Because of the low-density and dispersed nature of the medieval Khmer settlement pattern, Angkor lacks a formal boundary, and its extent is therefore difficult to determine. However, a specific area of at least 1,000 km2 (390 sq mi) beyond the major temples is defined by a complex system of infrastructure, including roads and canals that indicate a high degree of connectivity and functional integration with the urban core. In terms of spatial extent (although not in terms of population), this makes it the largest urban agglomeration in recorded history prior to the Industrial Revolution, easily surpassing the nearest claim by the Mayan city of Tikal. At its peak, the city occupied an area greater than modern Paris, and its buildings use far more stone than all of the Egyptian structures combined. After consolidating his political position through military campaigns, diplomacy, and a firm domestic administration, Suryavarman launched into the construction of Angkor Wat as his personal temple mausoleum. 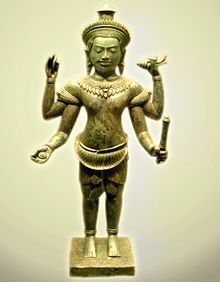 Breaking with the tradition of the Khmer kings, and influenced perhaps by the concurrent rise of Vaisnavism in India, he dedicated the temple to Vishnu rather than to Siva. With walls nearly half a mile long on each side, Angkor Wat grandly portrays the Hindu cosmology, with the central towers representing Mount Meru, home of the gods; the outer walls, the mountains enclosing the world; and the moat, the oceans beyond. The traditional theme of identifying the Khmer devaraja with the gods, and his residence with that of the celestials, is very much in evidence. The measurements themselves of the temple and its parts in relation to one another have cosmological significance. Suryavarman had the walls of the temple decorated with bas reliefs depicting not only scenes from mythology, but also from the life of his own imperial court. In one of the scenes, the king himself is portrayed as larger in size than his subjects, sitting cross-legged on an elevated throne and holding court, while a bevy of attendants make him comfortable with the aid of parasols and fans. Following the death of Suryavarman around 1150 AD, the kingdom fell into a period of internal strife. Its neighbors to the east, the Cham of what is now southern Vietnam, took advantage of the situation in 1177 to launch a water-borne invasion up the Mekong River and across Tonlé Sap. The Cham forces were successful in sacking the Khmer capital of Yaśodharapura and in killing the reigning king. However, a Khmer prince who was to become King Jayavarman VII rallied his people and defeated the Cham in battles on the lake and on the land. In 1181, Jayavarman assumed the throne. He was to be the greatest of the Angkorian kings. Over the ruins of Yaśodharapura, Jayavarman constructed the walled city of Angkor Thom, as well as its geographic and spiritual center, the temple known as the Bayon. Bas-reliefs at the Bayon depict not only the king's battles with the Cham, but also scenes from the life of Khmer villagers and courtiers. Jayavarman oversaw the period of Angkor's most prolific construction, which included building of the well-known temples of Ta Prohm and Preah Khan, dedicating them to his parents. This massive program of construction coincided with a transition in the state religion from Hinduism to Mahayana Buddhism, since Jayavarman himself had adopted the latter as his personal faith. During Jayavarman's reign, Hindu temples were altered to display images of the Buddha, and Angkor Wat briefly became a Buddhist shrine. Following his death, the revival of Hinduism as the state religion included a large-scale campaign of desecrating Buddhist images, and continued until Theravada Buddhism became established as the land's dominant religion from the 14th century. The year 1296 marked the arrival at Angkor of the Chinese diplomat Zhou Daguan representing the Yuan dynasty. Zhou's one-year sojourn in the Khmer capital during the reign of King Indravarman III is historically significant, because he penned a still-surviving account, The Customs of Cambodia, of approximately forty pages detailing his observations of Khmer society. Some of the topics he addressed in the account were those of religion, justice, kingship, agriculture, slavery, birds, vegetables, bathing, clothing, tools, draft animals, and commerce. In one passage, he described a royal procession consisting of soldiers, numerous servant women and concubines, ministers and princes, and finally, "the sovereign, standing on an elephant, holding his sacred sword in his hand." Together with the inscriptions that have been found on Angkorian stelae, temples and other monuments, and with the bas-reliefs at the Bayon and Angkor Wat, Zhou's journal is the most important source of information about everyday life at Angkor. Filled with vivid anecdotes and sometimes incredulous observations of a civilization that struck Zhou as colorful and exotic, it is an entertaining travel memoir as well. It is widely believed that the abandonment of the Khmer capital occurred as a result of Ayutthaya invasions. Ongoing wars with the Siamese were already sapping the strength of Angkor at the time of Zhou Daguan toward the end of the 13th century. In his memoirs, Zhou reported that the country had been completely devastated by such a war, in which the entire population had been obligated to participate. After the collapse of Angkor in 1431, many statues were taken to the Ayutthaya capital of Ayutthaya in the west,:139–140 while others departed for the new center of Khmer society at Longvek further south, though the official capital later moved, first to Oudong around 45 kilometres (28 mi) from Phnom Penh in Ponhea Leu District, and then to the present site of Phnom Penh. Some scholars have connected the decline of Angkor with the conversion of the Khmer Empire to Theravada Buddhism following the reign of Jayavarman VII, arguing that this religious transition eroded the Hindu conception of kingship that undergirded the Angkorian civilization. According to Angkor scholar George Coedès, Theravada Buddhism's denial of the ultimate reality of the individual served to sap the vitality of the royal personality cult which had provided the inspiration for the grand monuments of Angkor. The vast expanse of temples required an equally large body of workers to maintain them; at Ta Prohm, a stone carving states that 12,640 people serviced that single temple complex. Not only could the spread of Buddhism have eroded this workforce, but it could have also affected the estimated 300,000 agricultural workers required to feed them all. Other scholars attempting to account for the rapid decline and abandonment of Angkor have hypothesized natural disasters such as disease (Bubonic Plague), earthquakes, inundations, or drastic climate changes as the relevant agents of destruction. A study of tree rings in Vietnam, produced a record of early monsoons that passed through this area. From this study, we can tell that during the 14th–15th centuries monsoons were weakened and eventually followed by extreme flooding. Their inability to adapt their flooding infrastructure may have led to its eventual decline. Recent research by Australian archaeologists suggests that the decline may have been due to a shortage of water caused by the transition from the Medieval Warm Period to the Little Ice Age. LDEO dendrochronological research has established tree-ring chronologies indicating severe periods of drought across mainland Southeast Asia in the early 15th century, raising the possibility that Angkor's canals and reservoirs ran dry and ended expansion of available farmland. A 16th century Portuguese friar, António da Madalena, was the first European visitor to visit Angkor Wat in 1586. By the 17th century, Angkor Wat was not completely abandoned. Fourteen inscriptions from the 17th century testify to Japanese settlements alongside those of the remaining Khmer. The best-known inscription tells of Ukondafu Kazufusa, who celebrated the Khmer New Year there in 1632. While Angkor was known to the local Khmer and was shown to European visitors; Henri Mouhot in 1860 and Anna Leonowens in 1865, it remained cloaked by the forest until the end of the 19th century. European archeologists such as Louis Delaporte and ethnologists such as Adolf Bastian visited the site and popularized the site in Europe. This eventually led to a long restoration process by French archaeologists. From 1907 to 1970, work was under the direction of the École française d'Extrême-Orient, which cleared away the forest, repaired foundations, and installed drains to protect the buildings from water damage. In addition, scholars associated with the school including George Coedès, Maurice Glaize, Paul Mus, Philippe Stern and others initiated a program of historical scholarship and interpretation that is fundamental to the current understanding of Angkor. Work resumed after the end of the Cambodian Civil War and, since 1993, has been jointly co-ordinated by India, Germany, Japan and UNESCO through the International Co-ordinating Committee on the Safeguarding and Development of the Historic Site of Angkor (ICC), while Cambodian work is carried out by the Authority for the Protection and Management of Angkor and the Region of Siem Reap (APSARA), created in 1995. Some temples have been carefully taken apart stone by stone and reassembled on concrete foundations, in accordance with the method of anastylosis. World Monuments Fund has aided Preah Khan, the Churning of the Sea of Milk (a 49-meter-long bas-relief frieze in Angkor Wat), Ta Som, and Phnom Bakheng. International tourism to Angkor has increased significantly in recent years, with visitor numbers reaching around 2 million a year by 2014; this poses additional conservation problems but has also provided financial assistance to the restoration effort. The increasing number of tourists, around two million per year, exerts pressure on the archaeological sites at Angkor by walking and climbing on the (mostly) sandstone monuments at Angkor. This direct pressure created by unchecked tourism is expected to cause significant damage to the monuments in the future. In sites such as Angkor, tourism is inevitable. Therefore, the site management team cannot exclusively manage the site. The team has to manage the flow of people. Millions of people visit Angkor each year, making the management of this flow vital to the quickly decaying structures. 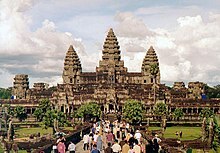 Western tourism to Angkor began in the 1970s. The sandstone monuments and Angkor are not made for this type of heightened tourism. Moving forward, UNESCO and local authorities at the site are in the process of creating a sustainable plan for the future of the site. Since 1992, UNESCO has moved towards conserving Angkor. Thousands of new archaeological sites have been discovered by UNESCO, and the organization has moved towards protected cultural zones. Two decades later, over 1000 people are employed full-time at the site for cultural sensitivity reasons. Part of this movement to limit the impacts of tourism has been to only open certain areas of the site. However, much of the 1992 precautionary measures and calls for future enforcement have fallen through. Both globally and locally the policy-making has been successful, but the implementation has failed for several reasons. First, there are conflicts of interest in Cambodia. While the site is culturally important to them, Cambodia is a poor country. Its GDP is marginally larger than Afghanistan’s. Tourism is a vital part to the Cambodian economy, and shutting down parts of Angkor, the largest tourist destination in the country, is not an option. A second reason stems from the government’s inability to organize around the site. The Cambodian government has failed in organizing a robust team of cultural specialists and archaeologists to service the site. The religion of pre-Angkorian Cambodia, known to the Chinese as Funan (1st century AD to ca. 550) and Chenla (ca. 550 – ca. 800 AD), included elements of Hinduism, Buddhism and indigenous ancestor cults. 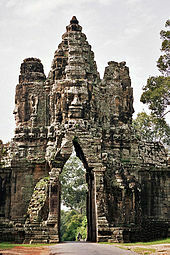 Face towers of the Bayon represent the king as the Bodhisattva Lokesvara. Angkor (អង្គរ) is a Khmer word meaning "city". It is a corrupted form of nokor which derives from the Sanskrit nagara. 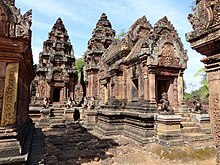 Banteay (បន្ទាយ) is a Khmer term meaning "citadel" or "fortress" that is also applied to walled temples. Baray (បារាយណ៍) literally means "open space" or "wide plain" but in Khmer architecture refers to an artificial reservoir. Esvara, or Isvara, (ឦស្វរៈ ~ ឥស្សរៈ) is a suffix referring to the god Shiva, especially its omnipotence, freedom and independence. Gopura is a Sanskrit term (गोपुर) meaning "entrance pavilion" or "gateway". Jaya (ជយ ~ ជ័យ) is a prefix derived from Sanskrit meaning "victory". Phnom (ភ្នំ) is a Khmer word meaning "mountain". Prasat (ប្រាសាទ) is a Khmer term derived from Sanskrit prāsāda and usually meaning "monument" or "palace" and, by extension, "ancient temple". Srei (ស្រី) is a Khmer term with two possible meanings. Derived from Sanskrit strī (ស្រ្តី) it means "woman", derived from Sanskrit sirī (សិរី) it means "beauty", "splendor" or "glory". ^ Benfey, Theodor (1866). A Sanskrit-English Dictionary: With References to the Best Edition of Sanskrit Author and Etymologies and Camparisons of Cognate Words Chiefly in Greek, Latin, Gothic, and Anglo-Saxon (reprint ed.). Asian Educational Services. pp. 453, 464. ISBN 8120603702. ^ a b c Evans et al., A comprehensive archaeological map of the world's largest pre-industrial settlement complex at Angkor, Cambodia, Proceedings of the National Academy of Sciences of the USA, August 23, 2007. ^ Evans, D., Pottier, C., Fletcher, R., Hensley, S., Tapley, I., Milne, A., & Barbetti, M. (2007). A comprehensive archaeological map of the world's largest pre-industrial settlement complex at Angkor, Cambodia. Proceedings of the National Academy of Sciences, 104(36), 14277-14282. ^ Chandler, A History of Cambodia, p.40. ^ "Lost City of Angkor Wat". nationalgeographic.com. Retrieved 28 March 2018. ^ Tom St John Gray, Angkor Wat: Temple of Boom Archived March 17, 2013, at the Wayback Machine, World Archeology, 7 November 2011. ^ Coedès, Pour mieux comprendre Angkor, pp.64–65. ^ Richard Stone, Divining Angkor, National Geographic, July 2009. ^ Buckley, B. M., Anchukaitis, K. J., Penny, D., Fletcher, R., Cook, E. R., Sano, M., ... & Hong, T. M. (2010). Climate as a contributing factor in the demise of Angkor, Cambodia. Proceedings of the National Academy of Sciences, 107(15), 6748–6752. ^ AAP (14 March 2007). "Climate change killed ancient city". NEWS.com.au. Archived from the original on 16 January 2008. Retrieved 12 November 2009. ^ Nelson, Andy (10 November 2009). "The secret life of ancient trees". Christian Science Monitor. Archived from the original on 12 November 2009. Retrieved 12 November 2009. ^ Masako Fukawa, Stan Fukawa (6 Nov 2014). "Japanese Diaspora – Cambodia". Discover Nikkei. Retrieved 18 October 2015. ^ Lawrie, Ben. "Beyond Angkor: How lasers revealed a lost city". bbc.co.uk. BBC. Retrieved September 23, 2014. ^ Coedès, Pour mieux comprendre Angkor, p.18. ^ Coedès, Pour mieux comprendre Angkor, p.2. ^ Chandler, A History of Cambodia, pp.19–20. ^ Higham, The Civilization of Angkor, p.46. ^ Coedès, The Indianized States of Southeast Asia, p.73f. ^ a b Chandler, A History of Cambodia, p.20. ^ a b Higham, The Civilization of Angkor, p.57. ^ Chandler, A History of Cambodia, p.34. ^ Higham, The Civilization of Angkor, p.9, 60. ^ Stern, "Le temple-montagne khmèr," p.615. ^ Stern, "Le temple-montagne khmèr," p.612. ^ a b Stern, "Le temple-montagne khmèr," p.616. ^ a b Higham, The Civilization of Angkor, p.63. ^ Higham, The Civilization of Angkor, pp.73ff. ^ Higham, The Civilization of Angkor, p.118. ^ Coedès, Pour mieux comprendre Angkor, p.63. ^ Higham, The Civilization of Angkor, p.121. ^ Coedès, Pour mieux comprendre Angkor, p.62. ^ Higham, The Civilization of Angkor, p.133. ^ Higham, The Civilization of Angkor, p.137. ^ a b c Chandler, A History of Cambodia, p.72. ^ Coedès, Pour mieux comprendre Angkor, p.19. ^ Murdoch, Lindsay (2013-06-14). "The lost city". The Age. Freeman, Michael; Jacques, Claude (1999). Ancient Angkor. Trumbull, Conn.: Weatherhill. ISBN 0-8348-0426-3. "Climate change killed ancient city". The Australian. 2007-03-14. Archived from the original on March 24, 2007. Retrieved 2007-03-16. Dayton, Leigh (2007-08-14). "Angkor engineered own end". The Australian. Archived from the original on 2007-09-10. Retrieved 2007-08-14. Wikimedia Commons has media related to Angkor. Angkor: City of the God Kings – Timeline - World History Documentaries.